Welcome to livingtheword. This is a Catholic Scripture site reflecting on the Sunday Readings each week. 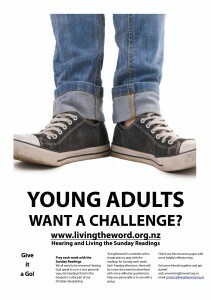 The aim of livingtheword is simple: to encourage Young Adults with a scripture resource they can use personally or in a group. A download of readings / reflection document is on-line every Tuesday afternoon 2pm. Subscribe if you wish to have it delivered straight into your inbox. Easy! Hearing and Sharing is relatively easy, but what about living what we hear? This brings us to the pair of feet on the front page. One of the issues for young adults is that Christian faith and Catholic teachings can just become a lot of ‘words’. And the bible can be simply a huge collection of ‘words’. The shoes are symbolic. It is easy to stand still, shrug shoulders, stand apart, resist getting involved. Criticise. Complain…. more words! How can we move beyond this trap to get moving? We need to push on beyond interesting, beyond fascination, to actually make some decisions that apply the scriptures to our lives. Jesus wants us to be more than fascinated by his words. He wants transformation in our lives. And he seemed a bit upset with many who cried ‘Lord, Lord and didn’t do what he said’ (Luke 6,46). So, welcome aboard. Join up. Be part of the change the Church needs so that our generation today see faith being lived out. Be someone livingtheword. Enjoy the journey of hearing, sharing and livingtheword! We are in the planning stages at our Parrish for a bible study Sunday based scripture group. I have signed up to receive the hand out on Tuesday’s of each weekvia e-mail. My concern and question is our group is going to be meeting on Wednesday’s to reflect on up coming Sunday readings. Is there any way that one can receive that handout before Tuesday for the following weeks readig, My concern is that the group will not have enough time to prepare before we gather on Wednesday. I have just accepted responsibility for administering these reflections and discovered your post from last year. I am sure the situation has long since been settled for you and trust your Scripture group is still going well and blessing participants with growth and knowledge in faith and life. Fr Frank may well have contacted you by email long ago. If not we apologise. Unfortunately the reflections are not able to be posted earlier than Tuesday at this stage. Many groups in fact reflect on the Sunday passed. That way they have all experienced the reading, homilies and Liturgy perhaps from different priests in different Mass celebrations and have had some time to ponder the Word before they meet. It can also help the ‘living the word’ aspect fit more closely to the readings of that week and offers a great preparation for the next Sunday. We pray for you and thank you for your interest in Living the Word.